Pi Day falls on March 14 every year. 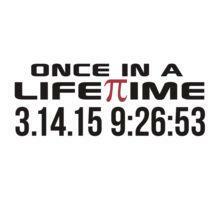 But this year, Pi Day 2015 is even more special than usual because it will be March, 14, 2015, which can be written 3-14-15. This happens only once in a century. Pi is the Greek letter “π,” and in mathematics it represents the ratio of the circumference of a circle to its diameter — which is approximately 3.14159265359. It is commonly referred to as 3.14, henc e why Pi Day is celebrated on March 14, or 3/14. But with this year being '15, it's spot on to the ten thousandth place. Pi itself is an infinite number. If you want to take it a step farther, celebrate at 9:26 a.m. because Pi is 3.14.15926, or take it out to the second and mark 9:26:53 to get to 3.141592653. Measure the circumference and diameter of your pie. Divide the circumference by the diameter. Voila! It should equal 3.14. Alternatively, calculate the circumference of a pie with the formula 2πr (r = radius) or π times the diameter. Remind kids that diameter = 2r. Do all these calculations to see that they're equivalent. Find more facts about Pi Day here. Okay, I may conflating my math and science with the title, but this is a great way to give kids a way to visualize pi. Take a round object and carefully wrap string around the circumference of your circular object and cut it so that it's the same length at the circumference. Take that string and stretch it across the diameter of your circular object. See how many times you can stretch it. (You can either cut it or just go back and forth). Do this with some other round objects of different sizes and compare the results. Those results should be that, regardless of the circle object, the string will be 3 complete diameters and a little extra. This could be yummy if you do it with different round foods at dinner, like pizza, quiche, and pie for dessert, though cookies, cake or muffins will also work. For dinner, this is a great reason to have a pizza pie or a quiche. For dessert, have your favorite dessert pie. See if your kids can come up with a dinner menu with all round food with items like carrot coins, grapes, peas, etc. Another reason to celebrate? March 14th is also Albert Einstein's birthday. You can send an e-card for Pi Day here. I'm partial to the cute ones offering infinite hugs or smiles. I think my husband, who was a math major in college, is going to get a big kick out of his. * What do you get if you divide the circumference of a bowl of ice cream by its diameter? * What do you get when you cut a jack-o-lantern by its diameter? Check out these fun activities designed to celebrate Pi Day. TeachPi.org has lots of educational ways you can celebrate Pi Day. Hope Pi Day 2015 is a happy one! 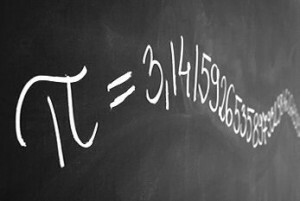 Get more information about the history of pi and Pi Day here.